Tony Cummings reports on CROSS RHYTHMS PLYMOUTH, the radio station which is bringing new hope to the city of Plymouth. It's a bitterly cold evening in November but in a small room in Plymouth's suburban area of Peverell something quite extraordinary in the communication of the gospel message is pouring out across the city. From this room at the office HQ of a media company, Cornerstone Vision, Cross Rhythms Plymouth carries out its amazing mission of broadcasting Christian radio 24 hours a day, seven days a week. The music sound and a number of specialist programmes broadcast by CR Plymouth originate from the Cross Rhythms parent station in Stoke-on-Trent. On the air at the moment is "The Avenue", a timeless salvation message preach from The Tribe's 'Raise Your Game' album. At its close CR Plymouth's Station Director Chris Girdler talks about the station and its spiritual effect on Devon's major city. "You take a track like this. . . it's preaching put to music and what a clear presentation of the Gospel it is! I get really excited when I think of the effect this kind of music is having on the city of Plymouth." Since its launch on 29th March 2007 Chris and the CR Plymouth team have received a regular flow of emails, phone calls and letters testifying to the effect the station is having. Typical is one from Charlie: "My parents are not great TV viewers or radio listeners, however I managed to get them to listen to Cross Rhythms whenever they came down to Plymouth to visit us. I've slowly been feeding them CDs of praise and worship and taking them to our church. A seed was planted. They found their own way and tonight at their church they gave their lives to Christ. A huge thank you! It was the anointing on Cross Rhythms that planted that seed." Strangely enough even opposition to the station's bold Christian content is an encouragement to Girdler. He tells a tale of how a lady, claiming to be a witch, phoned the station after being affronted by what she saw as pernicious Christian views. Says Chris, "The fact that the Christian community being noticed by a lady like that should be an encouragement. We are still in the early days of this station but it has an absolutely fantastic potential to change the spiritual atmosphere in Plymouth." I ask Chris to go over the history of the station. 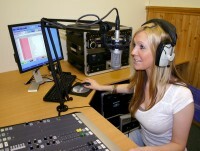 "It really goes back to when Cross Rhythms radio was birthed in Plymouth nearly 25 years ago by Chris and Kerry Cole. In the years since, the ministry has grown and expanded and of course, was re-located to Stoke-on-Trent in the late 1990s. The links between Plymouth (Cornerstone Vision) and Stoke have remained very strong and we were thrilled when Cross Rhythms moved to its new HQ in Hanley and was awarded an FM pilot access community radio licence shortly after. "When OFCOM announced its intention to introduce community stations across the UK, Cornerstone Christian Fellowship in Plymouth decided to apply for a licence for Cross Rhythms in the city. Our application (with immense help from the team in Stoke) was submitted in November 2004 and in December 2005 we received the great news that we had been granted a community radio licence for five years. "We spent the first year sharing the vision with churches and individuals aimed at raising the £50,000 needed to install a state-of-the-art studio and associated transmission equipment. Throughout this whole process we were again helped enormously by the team at Cross Rhythms in Stoke, who answered a multitude of technical and programming questions." 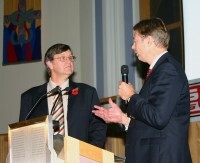 A successful pre-launch event was held in November 2006 attended by around 400 people. Says Chris, "Many folk caught the vision and came to understand that the Cross Rhythms licence was a real gift from God for the city of Plymouth. By late 2006 we had been given our frequency 96.3FM (Psalm 96:3 "Tell of His glory among the nations, His wonderful deeds among all the people") and began the countdown to the launch in March." With no full time paid staff Cross Rhythms Plymouth relies very heavily on the Cornerstone Vision team (headed by the trustees of Cornerstone Christian Fellowship Chris Cole, Ian Pilkington and Chris Girdler). Also crucial in getting the station on air and keeping it there are IT expert Chris Walker and telecoms and broadcasting expert Prof Graham Wade. After some test broadcasting, the launch broadcast was made on 29th March from St Andrew's Church in the heart of Plymouth, attended by the Mayor and Mayoress, civic leaders, business leaders and representatives from many churches across the city, including Bishop Christopher Budd. Enthuses Chris, "It was an unforgettable night and in many ways brought the history of Christian broadcasting in Plymouth full circle. Remember, the whole Cross Rhythms ministry was birthed by a radio programme in the 1980s which went out on the ILR station Plymouth Sound presented by Chris Cole. Now the city has a station like Stoke and already it is having an effect for the Kingdom of God." Already the station has been able to add into its broadcasting local links and inserts and it has just appointed Paula Hocking who, as events coordinator, will liaise with local churches and groups to bring more Plymouth-specific content to the station. Now, since 2007 CR Plymouth has begun its Let's Get Local, Let's Get Live appeal aimed at raising the £87,000 needed each year to employ a professional team who with volunteers will be able to maintain the quality output associated with Cross Rhythms. Explains Chris, "As part of the funding initiative and future strategy we are working on a close collaborative basis with Churches Together in Plymouth (CTiP) and their new chairman Chris Clewer, to emphasise the real positives to be gained by church and media working together for the benefit and glory of God's Kingdom in Plymouth. "A joint initiative between Cross Rhythms Plymouth and CTiP saw a series of meetings held on November 2 and 3 in Plymouth under the banner of City Transformation. Intercessors, business leaders, church members and church leaders were invited to separate meetings to hear from Lloyd Cooke of Saltbox Christian Centre and Jon Bellamy, Cross Rhythms CEO, about the success achieved in Stoke-on-Trent with the 2C7 initiative, the impact of media and the power of prayer in working with the local secular bodies and organisations. Local Plymouth MP Gary Streeter (a former Cross Rhythms trustee) shared his feelings with church leaders at the final meeting, saying that the church in Plymouth had 'an open window' of opportunity in the city to make a real difference to the social and spiritual wellbeing of its residents." These are exciting times for CR Plymouth. As the Jenny Barker programme begins Chris makes a final comment. "Plymouth is a city which has experienced a great deal of physical renewal since the war but now really needs a spiritual restoration. I'm sure that this station has a key part to play in that in the same way that Stoke-on-Trent is seeing the first green shoots of regeneration in part through its broadcasts. As more stations like ours are launched, I think we are going to see this story replicated in other areas, Stockton-on-Tees for one, in Britain. God is doing some great things through radio." It's a great radio station. Of course I am biased, I know half the people behind it! What channels is the program on...is it on LW, MW, SW or FM? Gets me all fired up!- His wonders to perform- Good to hear feedback from Paul in Coventry too, well done bro. This is a great testimony to God's provision in extending His kingdom. I've just finished presenting some shows on Radio Hope (bring fresh hope to Coventry) in collaboration with Cross Rhythms. I played some great sounding music on the playlist, which had some very positive feedback from the youth in Coventry. Please keep praying for Tim Coleman and the team in our application to bring Cross Rhythms Coventry on air. Bring it on!